If you’ve ever seen a list of emergency supplies on the Internet, odds are that one of the list items was Mylar blankets. These blankets can be found in almost any survival kit or bug out bag, and for good reason. They are small, weigh only a few ounces, retain 90% of your body heat, and have dozens of survival applications. 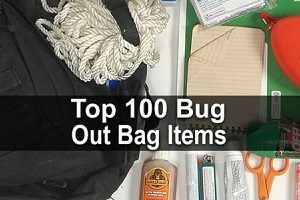 As I’ve said before, when packing a survival kit or bug out bag, you should focus on items that have multiple uses. 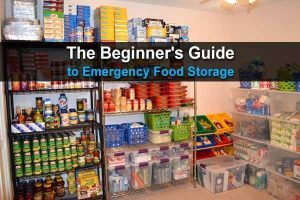 To make sure you have everything you could possibly need, every bit of space needs to be maximized, and items that only serve one purpose take up space you can’t afford to lose. When folded up, Mylar blankets are only 3.5 by 4.5 inches. But when unfolded, they are 4 by 7 feet, which is plenty large enough to protect you from the elements. If you aren’t convinced Mylar blankets are worth stockpiling, I think by the end of this article you’ll change your mind. They only cost a few dollars each, and some sites are giving them away for free. 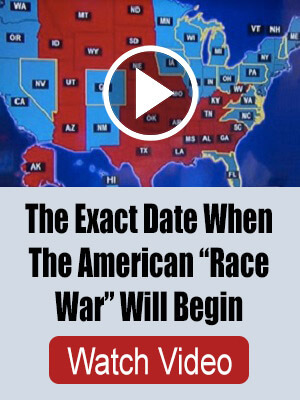 So without further ado, let’s move on to the list. 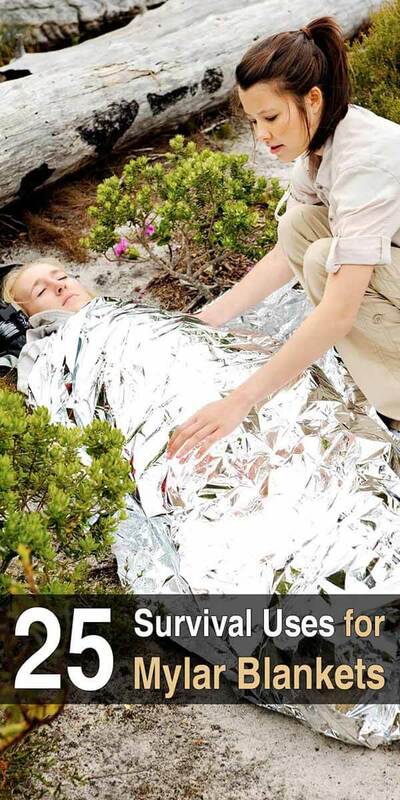 Here are 25 survival uses for a Mylar emergency blankets. A warming fire in the wilderness is a necessity, but the warmth from the fire is often lost because of the cold air zapping it away. Hanging your survival blanket on one side of the fire will reflect the heat back onto you or your shelter. The blanket can be used to signal for help. The reflective nature of the blanket will act as a beacon for air rescue teams. The blanket can be used to line a box to create a solar oven. The blanket is a lot like aluminum foil in many ways. It will heat the inside of the box by reflecting the sun’s rays (assuming you have plastic or glass to cover it with) and cook your meals. It can even be used in cool temperatures. The blankets can be used to create a number of different shelters. An A-frame or a simple lean-to can go a long way toward keeping you out of the weather. Your body heat will help heat the shelter, with the blanket trapping it inside. An emergency blanket can be used to create a solar still. Getting safe drinking water can be difficult if you are not near a water source. The blanket, a few green plants, and the sun could be what saves your life. Cutting the blanket up to use it as trail markers can help you find your way back to camp. It can also lead rescuers to your location should you find yourself lost and wandering aimlessly. In a winter survival situation, you can spread the blanket out on a sloped surface. Put snow on top of the blanket and let the sun melt it. Have a bowl or some other container at the corner of the blanket to catch the water. In a pinch, you can twist the blanket to make cordage. Cutting it into strips and braiding it together is also an option. The blanket can be cut and folded into a square to make a sling for an injured arm or shoulder. Use the blanket as a makeshift belt. You never know when you’ll have to scavenge for clothes, and there won’t be a mall where you can pick your size. You have to take what you can get, so you might need a belt. Cut a hole in the center and wear the blanket like a poncho. This can help keep you dry and warm. In a first aid situation, the blanket can be used to create a tourniquet to stop excessive bleeding. Use a strip of the blanket to act as an antenna for a radio or even a phone. The blanket can be used to hold a splint in place for an injured leg or arm. Place two sticks alongside the injured limb and use strips of the blanket to tie the sticks into place. A blanket can be used to collect rainwater. Dig a wide and shallow hole, place the blanket on top, and secure the corners with heavy rocks. Then wait for the rainwater to fill the blanket. Fill a clear container or large Ziploc bag with water. Place it on the blanket in full sun. You will have warm water to bathe or clean up with. Cut the blanket into squares to create a handy carrying tool. You can use it to carry gear, nuts, berries, and other wild edibles. Use strips as fishing lures. When you don’t have your fancy fishing gear or worms, the reflective strips can help catch the eye and hopefully the mouth of some fish. Cut a square of the blanket and place inside each of your shoes or boots. This can help prevent frostbite in a cold weather situation. The blanket will help trap in the heat your feet produce and act as a barrier against the cold. Laying the blanket on the ground to act as a barrier when you are sitting or sleeping is a good idea. It will not do much, but it is something. It would be even better if you could put pine needles or leaves down first and then the blanket over the top. If you are at home, you can use the blanket to cover the windows to block out the sun, reflect heat, and keep the place cool. Use strips of the blanket in your garden to deter birds. If you have fruit trees, tie strips to the branches to help scare off the birds. The twisting and turning in the breeze will reflect the sun and scare the birds away. Your survival garden is for your family, not to feed nature. Use the blanket as a crop cover in early spring to protect young plants. If you are in a tent, cabin or your house and relying on candles, place the light source in front of a hanging blanket and it will amplify the light. Hanging the blanket behind your wood stove will reflect the heat generated from the stove and back into your home. As I said before, Mylar blankets are very affordable so you may as well get a few. And right now, Frank Mitchell–author of Family Survival System–is giving away 500 Mylar blankets along with a copy of his book. You can claim yours here. You do not have to wait for a rainstorm to collect water. Desert survival. You dig a hole and line it in the evening. In the morning, dew will have collected. You would be surprised at how much dew there is in the desert.